From chalkboards to touch screen monitors, Silas Willard Elementary underwent monumental changes building their new school. Silas Willard has been a source of great pride in this community where in 1917 future president Ronald Reagan attended first grade. Yet many in the community knew the school needed change, since the century-old building had remained unchanged while technology rapidly advanced. 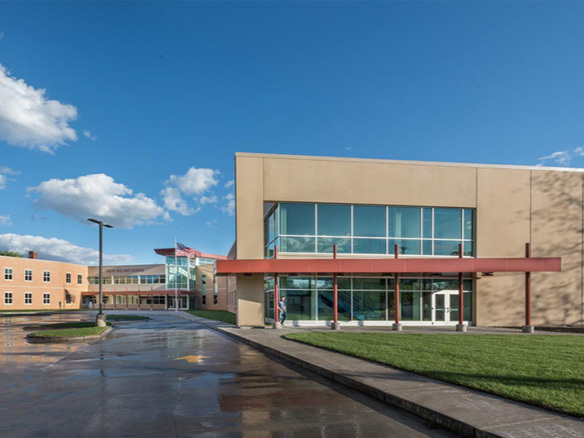 The Galesburg community explored several options, from renovating to additions, and concluded that building a new school was the best option to provide students an educational environment that met 21st century demands. Merging schools, district changes, and waves of new enrollment meant the old Silas Willard couldn't accommodate the students within the district. Instead, many students were bused to other schools. If maximum capacity were the only issue Silas Willard faced, a renovation and addition would have sufficed. Unfortunately, much of the building and its systems had reached the end of their useful service life. With all the work needed to bring Silas Willard up to par, it was not financially feasible to renovate: Nor would this meet Galesburg's goals for the project. Yet as planning began for the new school, everyone believed it important to preserve memories of the previous 102-year-old building. With a nod to its noteworthy history, a timeline of Silas Willard is on display, and a playground is being created in the footprint where the old school stood. The new Silas Willard can now accommodate 600 students, including 50 in special education. Designed by Cordogan Clark & Associates, the new school gives students the resources to succeed. With the 27 full-sized class rooms, dedicated art room, music room and stage, administration offices, library, cafeteria, and gym, Silas Willard is truly a full-service elementary school. Gone are the confined spaces. The 18 core classrooms are specifically designed to hold an average of 25 students, ensuring smaller class sizes despite the increase in enrollment. Throughout the school there is more area to grow. "I think it's a new start," Tiffany Springer, Silas Willard Principal said. "It's a celebration of all the efforts of the community members and taxpayers in Galesburg." Everything in Silas Willard serves to enhance the students' learning environment. At a time when art and music are being cut from curricula across the country, the music room and art room commit distinct areas for exploring the arts. Many schools face distracting noise and echoes. Yet here, when a gym class is extra loud, there will be minimal to no noise bleed thanks to acoustic hangers: specially engineered, these hangers far exceed the recommended standards for noise cancellation levels to safeguard student concentration, specifically in the reading room. Major upgrades in the newly modernized library bring Silas Willard into the digital age. With the ability to accept various media devices, a projection screen, and monitors, students can access educational materials with ease. On the flip side, the library is devised so students can easily browse its 13,000 volumes, giving them the best of both worlds. The library can accommodate large classes and individual students with a lecture area and spaces for individual study. Designed for the next generation of students, the new Silas Willard Elementary School is a transformative learning environment for the 21st century.